A new attractions in downtown Bangkok. 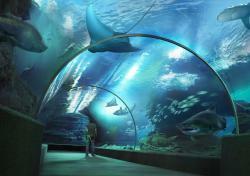 Open in December 2005, Siam Ocean World will be the largest aquarium in Southeast Asia. With world-standard exhibits and features, the aqaruim comprises a 270-degree acrylic under ocean tunnel, a panoramic oceanarium with a 360-degree view through a 10.5 metre diametre fishbowl, an 8-metre deep reef tank and a rainforest display. More than 400 species or 30,000 marine animals including Penguins, Blue Ring Octopus, Gray Nurse Sharks, Elephant Nose Sharks, Leafy Sea Dragons and Giant Spider Crab can be seen. open : daily from 9 a.m. to 4 p.m. Admission: 450 bah for adults and 280 baht fro children (80-120 cm.). How to get there : one can take a BTS sky train and get off at Siam Station. Located on the 5th Floor Siam Paragon. The 3D IMAX Theatre experience is teh world's most powerful and involving film experience. With breathtaking images up to seven stories igh and wrap-around 12,000 watt digital sounds, IMAX technology takes you to places only imagine. Located at the Faculty of Science, Chulalongkorn University Pathumwan, the institute was established to help develop and support the gem and jewellery industry of Thailand. It is dedicated to the collection, preservation, study and display of gems, jewellery and gemological equipment. There are also gem identification services and library. Museum : open on Mon-Fri from 9 a.m. to 4.30 p.m. This exquisite collection of traditional Thai house stands as a museum to the man who revived the Thai silk industry after the Second World War. The story of James H.W. Thompson is one upon legends are made. After serving in the U.S.A. armed forces, Jim Thompson settled in Thailand and found the tremendous opportunity to re-establish the Thai silk industry. In recognition of his services to the country, he was bestowed the royal award of The Order of the White Elephant. 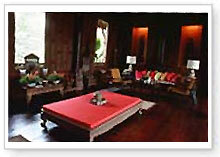 The company he founded, Jim Thompson Thai Silk, is recognized worldwide for its brilliant creations. He was an avid collector of Asian artifacts and antiques and The Jim Thompson's House is possibly the epitome of his collection. Before his mysterious disappearance in the Cameron Highland in Malaysia in 1967, his house was the talk of the town where he entertained his friends and visitors including the like of Somerset Maugham. The house sits on approximately a half acre of land on Mahanak Canal. Ban Khrua village where his silk weavers lived and worked. Is just on the other side of the canal. To build the house he gathered 6 original traditional teak structure from different parts of the country and brought carpenter from Ayutthaya who completed the house in 1959. The gardens are equally impressive with a lush tropical jungle imitating nature's haphazard beauty right in the center of the city. Jim Thompsons connoisseur collection of antiques and artifacts is on permanent exhibition, making this a magnificent museum of the lifestyle of the legend. Open daily: 9.00 am. to 5.00 pm. Admission fee: Adult 100 baht, Child 50 baht. Located in front of Lumphini Park, the statue was sculpted by Professor Corado Feroci, or Silpa Bhirasri as he was called by his Thai name, who gave it a final touch on 7 June, 1941. It was open on 27 March, 1942. This is where businessmen, tourists and Bangkok residents come to jog. Older folks practice their Tai Chi while others just relax in the fresh environment. Lumphini Park was originally an open field called Sala Field, the private property of King Rama VI. In 1925 he donated it to the nation as the first public park. The name Lumphini comes from the birthplace of Lord Buddha. The park was used as a fair ground and as the site for The Siamrath Phiphithapan Trade Fair held to promote Thai products. Covering an area of 58 hectares, Lumphini Park has so much to offer visitors right in the center of the city. The lush, green lawns are ideal for family picnics, while the two lakes have paddle and rowing boats for rent. Throughout the park there are vendors selling cool drinks and snacks. For the literary minded, there is a public library located within the park. Another way to exercise the brain is to sit at one of the many tables that are used for playing oriental board games such as checkers and Chinese chess. During the cooler months of the year, December and January, there are free concerts titled Sundays in the park. These concerts feature a whole range of musical entertainment from The Bangkok Symphony Orchestra to rock bands, traditional ensembles and Thai country music called Luk Tung. The performances start at 5.00 p.m. and seating is on mats on the grass. The early bird gets the best position. How to get there: BTS Sky Train to Saladaeng Station, Subway to Lumphini Station. Open : Daily 5 am. - 8 pm. The first camera and photograph museum established in Thailand and Asia, is located at the same building as the Faculty of Science, Chulalongkorn University on Phaya Thai Road. Historic photographs and imaging equipment, as well as its technological evolution are collected and displayed. Modern photographic arts, techniques and printing technology are also exhibited. Open : Mon - Fri from 10 a.m. - 3 p.m. The Queen Saovabha Memorial Institute is a popular attraction for both tourists and scientists, right in the heart of Bangkok. Here you can see some very venomous snakes actually doing good for the community. Thailand is the habitat for many varieties of venomous snakes as well as harmless species. Under the auspices of the Thai Red Cross Society, the snake farm was established and officially opened on November 22, 1923 to extract venom from the snakes in order to study and develop anti-venom serum to treat snake bite victims. The poisonous snakes that are indigenous to Thailand are cobra, king cobra, banded krait, Russell's viper, some pit vipers and sea snakes. These venomous snakes are provided by Thai farmers who are also snake catchers by profession. The snake farm pays them according to species and size. The normal procedure for extracting the venom is through the use of a glass receptacle with a membrane cover. The snake handler holds the snake just behind the head and places the glass receptacle for the snake to bite into the membrane. The venom flows into the glass receptacle. The venom is then used to make the vaccines. Visitors can see the extraction of the venom at scheduled times and wander through the breeding and holding areas to see the venomous snakes close at hand. Open : Mon. - Fri. from 8.30 a.m. - 4.30 p.m., Sat., Sun. and Public Holidays from 8.30 a.m. - 12 noon. Venom extraction : Mon. - Fri. at 11 a.m. and 2.30 p.m. holidays at 11 a.m. This is the major shopping area of Bangkok. It is very popular with tourists and Thais, particularly young, fashion-conscious Thai girls. The area started to develop around Siam Square in the late sixties when Chulalongkorn University utilized its land bank adjacent to the university. Since then, it has continued to progress with new shopping centers being built even now. Starting from the Pathumwan junction it stretches all the way to Wireless Road. The original development, Siam Square, is particularly popular with university students and young Thais who have just started their business careers. There is a well-used phrase on mobile phone calls Meet you at Siam. Opposite Siam Square is Siam Center which was the first western-style air-conditioned shopping complex in Thailand. Now this area has many other shopping complexes. The next section in this area is around the Ratchadamri and Ratchaprasong intersection where there are a selection of 5-star hotels and major shopping complexes catering for the more up-market shoppers. Many of the worlds leading fashion designers have boutiques in this locale. The Central World Plaza is the largest complex in this area and the site for Bangkoks New Year Countdown celebrations. During the cooler months of November to January, the major breweries sponsor the setting up of beer gardens on the plaza in front. The last point on this Fashion City map is Central Chidlom, another upmarket department store. This is at the Chidlom and Lang Suan intersection. Soi Lang Suan has many condominiums and a variety of restaurants and bars catering to the more affluent members of society. The Suan Lum Night Bazaar is a great place for an inexpensive night out that offers fabulous shopping, restaurant or food court dining, live entertainment and a superb choice of beers. The shopping area is well laid out with neat streets lined on both sides with shops selling clothes, handicrafts, souvenirs, and a myriad of other items. There are alleyways between the main streets, which are crammed with smaller stalls offering great bargains. You'll be pleasantly surprised at what you might find here. Spread throughout the complex, are many restaurants and bars. The range of cuisine is quite extensive including Thai and Chinese seafood, Indian, Japanese and German. As you wander along the main street, you'll see The Joe Louis Puppet Theatre. This is truly unique. This is a puppet theatre presenting performances of the Ramakien. With three puppeteers manipulating each puppet. They are in full view of the audience and even come off the stage. The main attraction at Suan Lum Night Bazaar is the huge beer garden and food court covering an area about the size of two football fields. On three sides there are stall selling a delicious variety of food cooked before your eyes. There are also beer stalls on the right hand side offering all the local beers, many imported brands and some local brews from micro breweries in Bangkok and Chiang Mai. The center piece is a large stage where the latest local and foreign hit songs are performed by a variety of singers with their back up dancers. Great entertainment for free. All the food and drink stalls operate on a coupon system so it is easy to keep track of your spending. How to get there: Suan Lum Night Bazaar is on the corner of Wireless and RamaIV Roads. There is a Subway Station at Lumpini and the nearest BTS Skytrain station is Saladaeng. Sukhumvit Road runs all the way from the railway crossing at Ploenchit to the Cambodian Border in Trat. 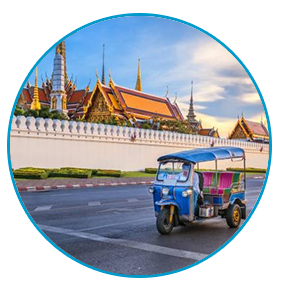 But the section from the first soi to Soi 55 is the one relevant to this presentation as it has much to offer visitors and locals alike. There are restaurants all the way along Sukhumvit Road and in just about every side street. These cover just about every cuisine known to man. The area around Soi Nana at the beginning of Sukhumvit Road has many restaurants, particularly those serving Middle Eastern and Indian cuisine. This area is also well-known for its lively bar scene. 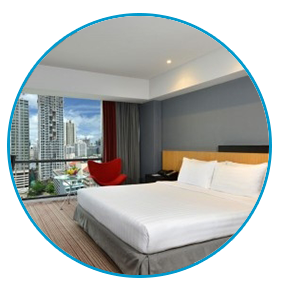 There are many hotels ranging from 5-star to cheaper establishment in the area from Soi Nana to Asoke Road. 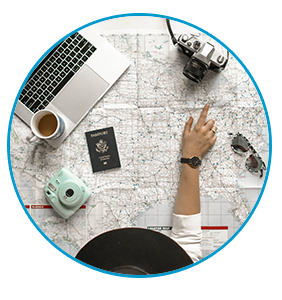 There are also a variety of international fast food restaurants as well as those serving French, Italian, Japanese and Korean in addition to Thai and Thai-Chinese meals. Another street of bars, Soi Cowboy, is just past Asoke Road. The restaurants and hotels continue up Sukhumvit Road and all the side streets. There is a beautiful park, Benchasiri Park, just before you reach The Emporium, yet another high class shopping center. The condominiums in this area have a high number of expatriate Japanese families residing here, so there are more Japanese restaurants and bars in this locale. Some call it Little Tokyo. Soi 55, also known as Soi Thonglor, is another street of restaurants and shops catering to the well-to-do. Opposite the entrance to Soi Thonglor on Sukhumvit Road, is a small soi that fills up at night with a multitude of food vendors and their carts serving supper into the early morning.